Forty percent of the Fortune 1000 companies in 2000 no longer existed in 2010. In July 2015, in an interview on CBS news, John Chambers (retired CEO of Cisco) predicted another 40% of the Fortune 1000 in 2010 would be gone by 2020. The current evidence supports his prediction. Their failure is no mystery. The postmortem research clearly shows they failed to close the adaptability gap. 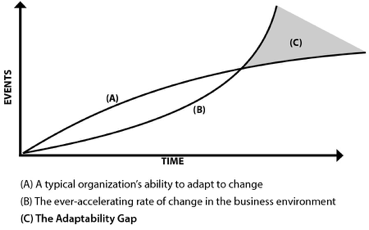 The adaptability gap is the gap between an organization’s performance and the performance required for success in our turbulent, rapidly changing business environment. Whether the organization “flourishes or flounders” depends on how quickly the leaders respond to an emerging adaptability gap. Traditionally, an organization’s culture follows a similar logarithmic curve; as successful methods of dealing with technical challenges accumulate, the organization calcifies; flexibility and versatility decline. Cultural inertia — Immunity to Change — accumulates. Strong beliefs and habits become entrenched. This is the existential leadership challenge that must be addressed by the leaders of every organization. Yesterday’s logic is to regard these issues as technical challenges, rather than adaptive challenges. A technical challenge is any problem that can be solved by replicating a proven process within the existing culture. Conversely, an adaptive challenge does not yield to established methodology. Its resolution requires curiosity and creativity. Adaptive challenges are only solved by experimentation and discovery; discovering new ways of thinking, feeling and behaving which always requires a culture shift. However, the purpose of an organization’s culture is to preserve its identity, traditions, and its institutional wisdom. Organizational cultures innately resist change; thus, the logarithmic rate of change. The exponential rate of change in the business universe is best described as volatile, uncertain, complex and ambiguous (VUCA). VUCA is a military term that describes the combat environment. Leaders have been slow to recognize that these turbulent, combat-like conditions exist in dealing with the adaptive challenges that are disintegrating so many established business organizations. The signals that an unrecognized adaptability gap is emerging are the same symptoms of other equally serious problems. It is easy to miss these signals until it is too late if the leaders are not looking for them. Challenges keep recurring in a whack-a-mole pattern. Intractable problems do not yield to established practices and procedures. Strategic initiatives are not delivering the expected results. Leadership teams are overwhelmed with chaos and stress twenty-four seven. Conflict or communication breakdowns occur frequently. Enthusiasm, morale and creativity are low; turnover is high. Either top-line or bottom-line growth is flat or declining. Market share is declining; new products are not gaining traction. When these signals persist over several months, leaders need to examine their existing beliefs and behaviors to see where their policies and systems are not congruent with the realities of the business environment. This is what an adaptive challenge (and the resulting adaptability gap) looks like. If, as a key leader in your organization, you have not encountered any adaptive challenges (and their ensuing adaptability gaps), be alert and get prepared. Your business universe is changing so rapidly that technically driven, adaptive challenges will soon show up – possibly as a Black Swan! The record shows that survival favors organizations whose CEO has a long-term perspective with a focus on the customer and employee engagement rather than a CEO with a short-term perspective with a focus on quarterly earnings. The long-term view enables a company to “flow” with the emerging adaptive challenges (think: Netflix), rather than just scrambling to survive quarter by quarter (think: Blockbuster). **With full apologies to Peter, Paul & Mary. The wisdom of their 1962 hit is just as true today as it was then. Download a copy of this Article! Give us you email address and we will give you instance access to a copy of this article.